When Pantone announced the 2019 colour of the year ‘Living Coral’ the Loft Blind HQ were inspired! Every year people have their own opinion on the chosen colour, and this year we were not left disappointed. It didn’t take long before we saw Pinterest boards bursting with ‘Living Coral’ inspired imagery; so, we thought we would join in the colourful fun and give you some coral décor inspiration too. Living Coral is a peachy orange colour with wonderful golden undertones which can be great to give your home a bright, yet warm pop of colour without being too harsh. This colour is fun whilst not being too loud and garish; this is the perfect colour for all those in 2019 who want to move from safe interior colours to something a little unique. If you are unapologetically unafraid of colour, then incorporating the delightful coral into your home as an accent wall will give any room the instant wow factor, while still having a cosy homely feel. Alternatively, if you are not ready for a block coloured coral feature wall there are stunning wall papers available with ‘Living Coral’ coloured inspired prints that will introduce colour into your home and impress any guest. If you want to avoid painting and decorating but still desire a pop of coral in your living space, furniture and accessories is the perfect way to achieve this! Living Coral coloured sofas are a great stand out feature, however, if you are learning to love colour why not start small with throws, pillows, wall art or decorative items. Now for our favourite part… blinds. If you have been inspired by the ‘Living Coral’ trend and now need blinds to finish off the room, then we have got you covered. It might surprise you just how easy it is to incorporate other colours with your coral colour pallet; we have personally found it looks amazing with greys, greens and even shades of blue. 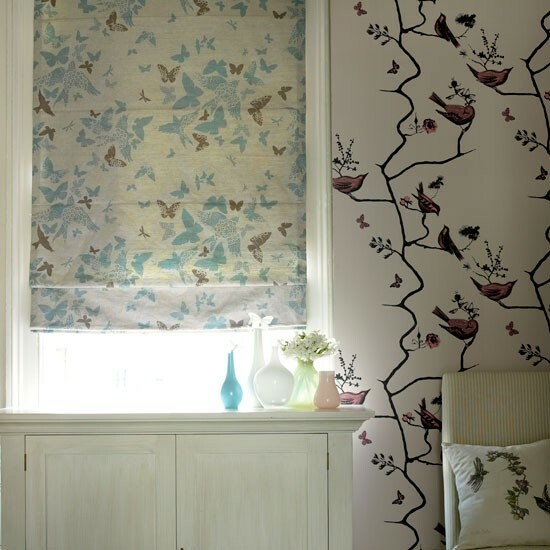 At Loft Blinds, we have a range of wonderful blinds in a variety of colours and styles. You can search all our colour and style range by using our Blind Builder. If you have any questions about our VELUX®products, contact us today! Are Velux Venetian Blinds the Best Option for You? Are you looking for low maintenance Velux roof blinds? If so, Velux Venetian blinds could be the perfect solution for you, and they are best for controlling the amount of sunlight you want entering your room too. As with all Velux products, you can expect great quality. Velux Venetian blind slats are made of aluminium which are lacquered on both sides, making them easy to wipe down and keep looking clean. These blinds are moisture resistant which means they are great for rooms with high humidity such as bathrooms and kitchens. They should also be considered for rooms that you want to easily adjust the amount of light coming in. Say goodbye to unappealing hanging cords with the Velux Venetian blinds. These cordless blinds could not be easier to use. Simply position the blind by using the control bar (found at the bottom of your blind) or to control the direction and amount of light entering your room slide the grip in the right-hand side rail, which will tilt the slats on your blind. The simplicity of these blinds is what makes them a great and popular choice amongst customers. If you are looking for a blind that allows you to control the amount and direction of light filtering into your room, gives you privacy, easy maintenance and fits neatly in with your décor, then Velux Venetian blinds could be the perfect solution for your home. Velux Venetian Blinds are available in 9 wonderful fade resistant colours, so you are sure to find the perfect match for your home décor. Check out all the colours available on our blind builder and pick your perfect venetian blind today or call us on 01243 782580 for more information. It is the ultimate battle between the Manual VELUX® blinds and Electric VELUX® Blinds, both high quality blinds but what are their main differences (aside from one being electric) and who are they best for? Ah, the manual blind, with hassle free installation thanks to the VELUX® Pick&Click!™ system and simple easy to use control bars, you can position your blinds with ease. The manual blinds are the best option for roof windows that are easy to reach; to operate you simply use the control bar positioned at the bottom of the blind to slide up and down. We stock manual blinds in Blackout blinds, Roller Blinds, Energy Blinds and Pleated blinds, offering a great selection of colour and designs. If you are unsure about colour and blind style we send our customers free swatches, so you can make sure you are 100% satisfied with the products you are ordering before they are delivered to your door! Say goodbye to standing on furniture and rearranging your room every time you need to open or close your blinds. Stop suffering with bright light and heat radiating through your hard to reach windows because you are unsure which blinds will do the best job. VELUX® electric blinds are high in quality and do all the hard work for you! Electrically operated your blinds can be controlled anywhere in the room at the push of a button on a remote. Blackout Blinds, Roller Blinds and Energy Blinds are the three different blind types available if opting for Electric Blinds. These, much like the manual blinds, come in a wonderful range of colours and patterns, so you will have no problem finding a design to match your home décor. Which blind is the best for your home? You decide! You can order your perfect blind with Loft Blinds today by using our Blind Builder. If you have any questions about the VELUX®products we stock, contact us today! At Loft Blinds, we are proud stockists of Velux® Blackout Blinds. Blackout Blinds have qualities that make them the perfect option for any room in the home and they look stylish too. In Need of Better Sleep? Are you struggling to sleep? Sensitivity to light could be a reason why you are not getting the amount of slumber you need! Whether you need to block out car or street lights that are filtering through your window during the night, or if you are working the late shift and need to catch a few z’s during the daytime, Velux® Blackout Blinds eliminate the light entering your room, so you can dream light free. Privacy is important in any home, and many choose to use Velux® Blackout Blinds in bedrooms, bathrooms and walk-in wardrobes for extra privacy. However, Velux® Blackout Blinds are also great for offices to block out the bright light reflecting off computer screens; they are great for rooms facing main roads or public walkways. As a child spends so much time in their bedroom, it is vital to make the room comfortable in terms of lighting and temperature. The bedroom is more than a place for your child to sleep, it’s a room for playtime and homework too! Blocking out sunlight in a child’s room with Velux® Blackout Blinds can encourage sleep and is perfect for nap time. Blackout Blinds not only block out the sunlight, they also control temperature in the room! At Loft Blinds, we know the importance of Blinds that perform well and look great. Velux® Blackout Blinds come in a range of wonderful colours and patterns that can match your décor perfectly. We also stock Disney Blackout Blinds that feature your children’s favourite characters, from Star Wars to Frozen; we have the perfect Blinds for you and your children! If you are interested in ordering Velux® Blackout Blinds from Loft Blinds, please use our Blind Builder today! You can also contact us on 01243 782580 for more information. Great Reasons Why You Should Choose VELUX® Roller Blinds! At Loft Blinds we are proud stockists of Velux® blind products. If you are in search of new blinds for your home but don’t know what to choose, check out all the wonderful qualities that could make roller blinds a great option for you! VELUX® Roller blinds are one of the most popular blind choices for customers. They are simple, yet stylish and versatile. 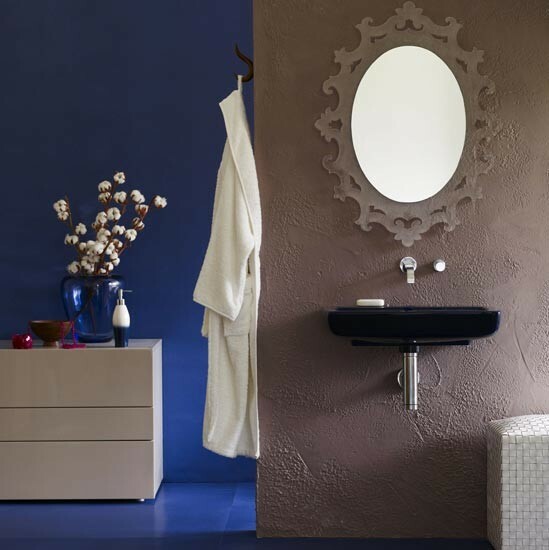 Offered in a range of colours and styles you are sure to find the perfect match to finish off your room. VELUX® Roller blinds are made of 100% translucent polyester fabric that lets the beauty of natural light filter through to your room, while providing the privacy you need. Roller blinds do a brilliant job of glare control without eliminating all light from a room, making them a perfect option for offices and living rooms. However, it is important to note that the level of light blocked is dependent on the colour of blind you choose. We all love low-maintenance household interiors! VELUX® Roller blinds can be cleaned with regular dusting; this is a simple way to keep your blinds looking clean and new. You can also vacuum the blinds using a brush attachment or delicately dab blinds with a damp cloth or sponge to keep them in tip top clean condition. Hate DIY? If so, have no fear because with the Velux Pick and Click system, installing your Velux Roller Blind could not be easier! For more information check out our ‘all you need to know about the VELUX Pick & Click System’ blog post. You can get the perfect Velux Roller Blind by using our Blind Builder. If you have any questions about Velux Roller Blinds or any other Velux products we stock, contact us today! We all want an easy installation process when it comes to household jobs. The Velux Pick & Click System makes blind installation a breeze, so you don’t need to be a DIY expert to get great results. Fitting your Velux blind with the pick and click method could not be easier! Start by simply securing the top of your new Velux blind into the pre-installed bracket that you will see on your Velux window. After the top of your blind is installed, you can then secure side rails to either side of the window frame using the screws and brackets provided. Stress-free, beautiful blinds at the click of a bracket; saving you time and energy to enjoy your temperature and light controlled home with Velux! No matter what style blind you have in mind, from Blackout to pleated, or Venetian to Roller, all these blind styles are pick & click ready! Do you have an old Velux window that doesn’t have the pre-installed brackets? Have no fear, Velux still makes your blind installation process easy, providing extra brackets when you order your new blind. Brackets can be purchased as spare parts. Get the perfect Velux blind by using our Blind Builder. If you have any questions or you are looking for more information on Velux products we stock, contact us today! Don’t deny it. Yes, there are still crazy men out there wearing shorts in that laissez-faire manner that says they are forever living their lives in the sunshine and that a little bit of frost never hurt anyone. Least of all them. Secretly, of course, they’re as cold as the proverbial witches you-know-what. But they can’t give in to comfort and conformity now and slip on a nice cosy pair of cords. It’s way too late for that. And them. You, on the other hand want to stay warm. But you want to do so with a little style, a little, shall we say it, class? I salute you and your covered legs. This blog is for you. Keeping our homes warm and comfortable throughout the colder weather is a challenge for many people. Especially if their homes are poorly insulated. And it’s very easy to tell those which fall into that category. Just wait until we have some snow and then go and take a walk around your neighbourhood. The poorly insulated homes will be the ones that ‘boast’ a bare roof. No snow, just a damp patch and some dripping water. Now, that might all look clean and tidy but in reality, it’s a sign of just how much heat is pouring up, up and away from the house, melting all the snow on the roof as it does so. The house that has a roof that is deep and crisp and even with the white stuff however. Now THAT’S a well-insulated house. Indeed, you can bet your last mince pie that its inhabitants will be sat in their shirt sleeves inside alongside a thermostat that is set to a healthy (and relatively frugal) 18-20 degrees or so. Not like those in the house with the bare roof however. Their heating system will be on full blast and they’ll be wondering why they’re still cold. The answer? Simple. Make sure your loft is insulated. Insulating your loft is one of the most effective methods you can employ to give your home a good Energy Efficiency Rating (EPC-and yes, the acronym should be EER but it isn’t!) and something you should always give a priority to if you have what is known as a ‘virgin loft’ (i.e.) one that has 25mm or less (and that includes none at all) of insulating. Take it from us, the sooner you act on a loft that is either poorly insulated or, the horrors, has zero insulation, the sooner you will start to notice the savings on your energy bill. Don’t believe me? Keep reading then. It’s estimated that, without proper loft insulation as much as 25% of the heat generated in your house will be lost as it rises upwards and out via the loft and roof. But hey, at least the starlings on the chimney breast will be warm-and if that’s all that matters to you then great! But most people would rather run an energy efficient home and save on the bills. Good loft insulation acts as a barrier. But it does it in two ways. Firstly and, as we are explaining here, it slows the movement of heat out of the house during the winter. But also, almost as importantly, it slows that same movement of heat coming into your house during the summer. It is then, in effect, a form of air conditioning for you that helps keep the house cool and comfortable. Does that sound all a bit too good to be true? It gets better. Because installing it is just about one of the easiest DIY jobs you can do in your house. Don’t know how to wire a plug or which end of a paintbrush is which? Fear not. This is something you can do for yourself. Remember, in order for you to have a nice warm house, you are going to need to have a cold loft. The best ones are those that, when you poke your head above the parapet cause you to take an involuntary breath of frigid air and say, “…bloody hell, this loft is cold”. When you are able to say that my son, your job is done and done well. Making your loft purposefully cold means laying insulation directly above the ceiling in order to produce this barrier to slow that upward movement of heat out of the home during the winter. It isn’t rocket science. Yet there are thousands and thousands of inadequately insulated homes all over the country with people living in them saying, “…it’s a bit raw in here love”. 95% of homes are insulated with wool insulation. Easy to obtain and, although a little bit bulky, fairly light and easy to carry-as in out of the store and into the back of your car (or a friends if you have one of those little cars that sounds like a hair drier) and then out of the back of the car, into your house and up the loft ladder. You’ve got that far? Hurrah! The part of the loft that you need to insulate is between the joists. They’re the long and sticky out bits of wood that you have to walk on to avoid putting a foot through the ceiling when you go up there to get the Christmas decorations down. See, you didn’t even know what a ‘joist’ was when you started reading this. Now you can drop the word into casual conversation over coffee with your friends. They’ll be ever so impressed. Mind you, it’s all very well talking the talk. You’ve now got to walk the walk. Most roof joists are around 100mm high. And guess what? You can get rolls of insulation that are 100mm thick (or less than that or greater, it depends on the height of your joists) which means you can roll them out, one at a time and in-between the joists. Then, once you’ve done that (and if you want to be so energy efficient, you need a cape and super hero name) you can roll out some insulation that is 200mm thick at right angles to the joists meaning that, when you're finished, you have a thick carpet-like layer of insulation in your loft that you can, if you wish, cover in sheets of MDF so that you have a surface that you can walk on-so no more hopping about from joist to joist for you. It’ll be a job well done. A loft that will, should a prospective buyer for your property poke his or her head up there greet with a satisfied nod of approval. But remember. It’s going to be a bit chilly up there. Infact, your loft may end up being so cold that you might, on occasion, find Bear Grylls doing a spot of arctic survival training up there. Which would mean a job really well done. There’s nothing like regarding your home as a Dalek would. “Dec-or-ate...dec-or-ate. You. Will. Be. Dec-or-ated”. 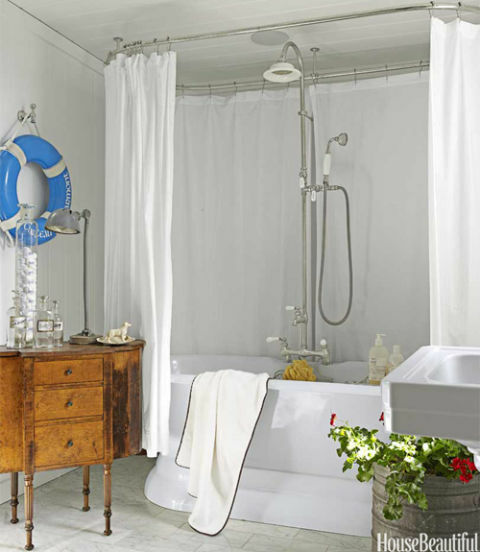 Most of us turn a whiter shade of pale at the thought of doing some decorating. I know someone whose kitchen needs a lick of paint for example. It’s a nice kitchen, light and contemporary with lots of new appliances. All that it needs to be finished is for a coat of paint to be applied to the walls. And that was a few years ago. It’s not even a day’s work. Yet the person in question just cannot bring themselves to do it. Ridiculous. But don’t laugh too long or too loud. Because we’ve all been there. Especially those of you with the bathroom that time forgot. Well procrastinate no more. It’s time to make a stand. A change even. Here are ten ways you can make a big difference to any room in your house. And guess what? None of these will take less than a day to do. Simple, quick, effective and pain free. 1. Hang a curtain in your kitchen. It not only looks good and just a little bit Mediterranean, it also helps to discreetly mask any work that might be going on behind it. Give yourself a little privacy and secrecy where you can weave your culinary magic out of the sight of casual onlookers. 2. Make the most of your rugs. If you’ve a big rug then placing all of a piece of furniture on it really sets it off both the rug and the furniture, creating a look that is warm and luxurious. However, if you have a really fine piece then don’t cover it up with a sideboard. Let it stand alone, uninterrupted and glorious with furniture arranged around it rather than over it. Resisting that urge also gives a room a feeling of light and space, one where the eye is drawn to the beauty of the rug astride your floor, something which can be a great conversation piece in itself. 3. Mix and match your bedding. Well why not? Having your sheets, duvet cover and pillow cases all the same colour might be practical. But practical is where it begins and ends. Do you really want cold practicality in your bedroom, what about some warm creativity? None of these items match-yet, put together it looks really quite charming, the sort of look you might have got in a New England hotel room back in the 1950’s. Nowthat is classy. Bright, clean, modern. State of the art even? Well here’s a thing. How about mixing all of that up a bit by putting an antique piece in there? It’s a spectacular juxtaposition of the old and the new-and another talking point. Who needs old copies of Cosmo in there when you can gaze upon a real piece of art? How about moving your seating away from the walls? There isn’t some archaic law that dictates that you have to push your expensive three piece suite up against the wall. 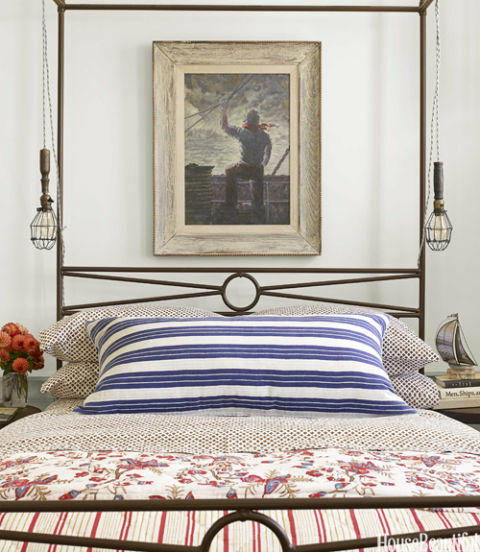 Pull it inside the room a bit, go for a warmer, cosier look. Having people seated closer together also encourages conversation. Give it a go. You’ll be surprised. 6. How about a swift and easy change of mood in your favourite room? If the look of your bedroom has grown a bit tired of late, you’ll be surprised at the impact a fresh colour of paint will have on both the room and its users! Try replacing safe magnolia with a vibrant blue or, for a calming and relaxing energy, a pastel green colour, aFeng Shui favourite with its calm and luxurious finish. 7. Completely change the look of a room in under half an hour. Can’t be done? Oh yes it can. And it’s as simple as moving a few things around. This will cost you nothing at all and is the sort of fresh but simple approach that not only gives a room a fresh new look but might also encourage you to create some space by getting rid of some of the clutter that doesn’t really work anymore. 8. Freshen up your old upholstery. Can’t afford to buy a new sofa (or, if you order one in July, be promised delivery “in time for Christmas”!)? Then why not freshen it up with some stylish throws or new cushions? 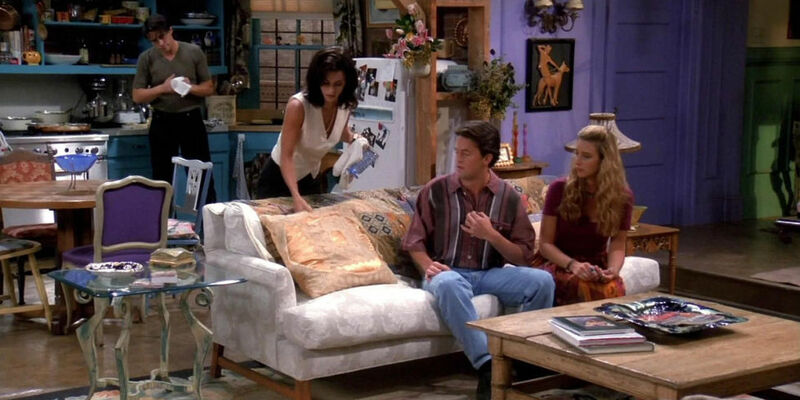 If you’re a fan of TV series Friends, you’ll recall how Monica’s rather ordinary looking sofa rarely looked the same in every programme? Large and bright cushions atop vibrant throws brought a relaxed and new look to it on several occasions, making the room both welcoming and cosy. The same principle can be applied to just about any piece of furniture that needs brightening up-beds, armchairs even tables which can be given a new look by covering them in either a bright piece of fabric or, for example, a collection of scented candles and bowls. There is no limit to your imagination so think simple but think big. 9. Hall of mirrors (sort of). Strategically placed mirrors are a great way of adding space and light to a room, a cost effective and attractive way of adding those two great assets to any home. 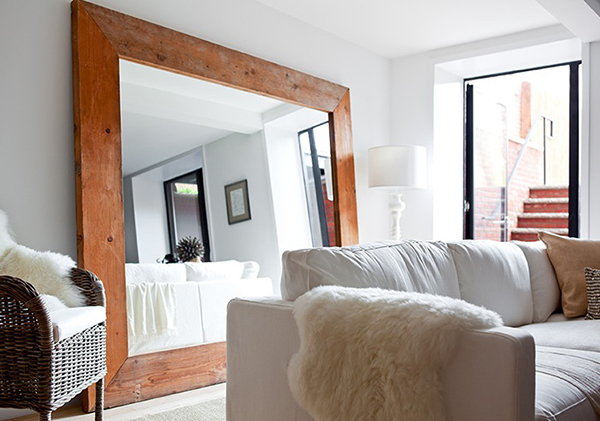 A mix of different styles of mirrors can bring space and personality to even the smallest and most modest of spaces-again, you and your imagination can wield some great results in the most simple manner, completely changing the look and mood of a room by simply opening your eyes to its possibilities. Windows are great on sunny, warm days when they let light and warmth flood into a room. But what about at night or on a winters day when you’d rather shut the outside world out of your life and home? Fear not, for the humble window can come into its own yet again. By brightening it up with a colourful blind, you’ll have made the minimal effort for a very high impact. If your windows are by Velux then there is a whole range of blind options for you throughout your home from colourful and fun roller blinds for a child’s bedroom to simple and effective blackout blinds for your own bedroom that manage to block out all of the light even if they are in a light colour. There are so many simple yet hugely effective ways of brightening up your home in this manner, one that is low on cost and time but high on impact with the only real investment that you’ll need to make being the price you put on your imagination. And as that is completely unique, doesn’t that make it rare and priceless? Go on. Indulge on both yourself and your home today. Think simple but act big. And let us know how you get on, we’d love to know and share. Whenever most people think of a loft apartment, it's invariably the Big Apple that comes to mind. Bright and spacious high in the sky living for the high flying. To rent or buy. Just don’t go thinking they’re the sort of places struggling artists or wannabee actors hang out because you’ll need pockets as deep as the foundations that go with some of these in demand warehouses. Because they don’t come cheap. How, for example, does $4,200,000 for a ‘spectacular full-floor duplex loft in the heart of Chelsea with outdoor space’ sound? ‘Outdoor space’ in one of the world’s most expensive areas of real estate? That’s going to bump up the price considerably. But these City realtors are nothing if not reasonable. You only need a 10% deposit for this airy paradise. Pie in the sky? Thought so. But there is some consolation. If you can’t stretch to something in Manhattan then how about Lambeth or Lewisham? Because loft living is catching on in London. And faster than it takes to put up something that looks like a giant walkie-talkie and calling it modern living. The idea of bringing New York loft-style living to London first caught on in the 1990’s. There didn’t seem to be a market at the time, indeed, there was seemingly no interest at all. Large and airy spaces at the top of dilapidated and largely forgotten old buildings were the rotting preserve of all manner of vermin; dank, dark dripping and foul. But then a project was taken on at a disused print factory in Clerkenwell. And everyone suddenly, and as if by magic, saw the light. Everyone, that is, apart from the Cities Estate Agents and Developers. They just saw a nice new Jaguar in their driveway. The not so new concept of open plan living with a nice view thrown in appealed to the creative set in the East End and, as a result, London started to love its abandoned loft spaces. Much of the appeal was down to the new concept offered by property developers called 'Live/Work'. This describes properties whose space is designed to incorporate both your professional and personal lives, the former made possible by the rise of digital technology meaning that the need to travel from home to work five days a week, at least in the traditional sense, is slowly becoming obsolete. Just think, your new commute might involve you grabbling a nice fresh Mocha from your kitchen and crossing the hallway into your home office. As far as London was concerned, it was the Borough of Hackney that helped set the standard. It’s reputation of being ran down and it’s need of massive investment saw the local authority encourage the regeneration of former factories and other abandoned industrial spaces for such use rather than devoting time and resources to developments that were solely residential in nature. Where a the visionary London Borough of Hackney led the way, other London Boroughs soon followed with the concept swiftly being copied in other major Cities across the UK. So, even if a place in New York is beyond you and London an unlikely dream at present, no reason to give up. How about a converted wharf in Norwich for example? There’s no reason why you shouldn’t have that rooftop space with a view if you’re willing to stretch your boundaries. Which, let’s face it, is better than stretching your wallet. Nasty: Have you ever had to deal with one of these in the loft? Your loft might be a dark and largely forgotten place at the moment. And let’s face it, if you only ever pop your head up there twice a year to either get or put back the Christmas decorations then its negligence of the very highest order. But even if you don’t fancy it up there, there are those that do. And the darker, the warmer, the more neglected it is, the better they like it. I’m talking about your having a close encounter of the unwanted kind. And right above your heads. They’re live and they’re potentially dangerous. And you’ve given them a home. And it’s fair to say you’re probably going to regret being so hospitable. We’re all familiar with the little s.o.b’s. How they like to annoy you when you’re out in the garden. There’s always one or two flying around when you’re just trying to enjoy a Pimms and a chat with some friends. And no matter how much you manfully run away from the yellow and black demons, they’ll lurk and come back for some more buzzing mayhem. Again and again and again. And that’s just a few of them. What about if you had several thousand of them nesting in your loft? With just the ceiling dividing you and a life of pain. Pain of the stinging kind. Wasp infestation is a potentially troublesome problem from around May to November. A particularly troublesome one if you are allergic to their stings as anaphylactic shock from one can, in some cases, result in death. If you do get a wasps nest in your loft then yes, do, by all means, admire its intricate beauty. Their beautifully crafted homes are, after all, one of nature’s true wonders. But you don’t want to be getting to close to it for too long. Wasps will instinctively attack anyone that ventures too near to their nest. And, unlike a bee, they can sting you more than once. The few that you notice near the entrance to the nest will be the sentries. Once they’ve stung you a few times, they’ll go off in search of reinforcements. And believe me, you do not want to be in the immediate vicinity when they arrive. Clearly, therefore, if you do notice that you have a wasps nest in your home then you need to do something about it and quickly. We’re not going to tell you how to do that however. Because that’s a job for the experts. And believe me, the chap in that photo isn’t dressed like someone given the job of clearing up post-Chernobyl for nothing. He knows what they’re capable of when suitably provoked. So don’t provoke them. And it’s rather easy to provoke a wasp. You can do so by merely looking at them in a funny way. So think about what sticking an enquiring finger into a nest might do. So, let someone else do it. Local councils will have their own pest removal teams. There will also be private contractors only too willing to put their heads where it hurts. Just make sure it’s their heads that go up in your loft to remove the yellow peril, not yours.